Ribolitta – The Recipe is a dish that can become a meal in itself, in a big round soup bowl or sophisticated soup plate, served straight out of a big pan or out of a fabulous soup tureen – whatever you fancy. Or it can be a small starter at the beginning of a 3 or 4 course meal. So the amount of people this recipe will serve is up to you, but the recipe ingredients are for 4 people. It is a fabulously gutsy Italian ‘Peasant’ soup or broth, using up lots of vegetables and thickened with slightly stale bread (don’t worry, it doesn’t taste stale) or Ciabatta. There are so many different recipes for Ribolitta, and, being honest, I trawled through all the books that would lead me to the one recipe I wanted, but, as most cooks do, I ended up putting together my own recipe. So great thanks especially go to The River Cafe Cook Book, Jamie’s Italy and the FilippoBerio ‘The Mediterranean Olive Oil Cook Book’. Also, a big thank you to a brilliant young chef voted ‘Young Chef of the Year 2010’, Steven Parle, Chef and Owner of Dock Kitchen, Ladbroke Grove, London who shared his tips with me for Ribolitta on Twitter. I hope he approves of my final recipe! I enjoyed spending an afternoon in my kitchen (garden first, cutting the Cavolo Nero), surrounded by all those lovely foods and aromas that just called out to me “ITALY”, but was a bit nervous that it would turn out as I wanted. But it really did. The finished Ribolitta was just superb – so full of flavour, so unexpected, but so good. I have been growing Cavolo Nero mainly because it is a great winter vegetable, but it is the main ingredient of Ribolitta. It took me almost 30 minutes to very carefully wash every leaf edge, looking for bugs or worse that creep into the curly edge of the leaf. Then, after washing and rinsing twice (I can’t bear insects or things in food) I cut the thicker veins out of the leaves, then slice the remainder into biggish bit-sized pieces. Believe me, this recipe takes a lot of doing, but the result makes all that hard work worth it. Ribolitta calls for the use of Cannellini Beans. Nowadays these can be bought in a tin, and just need warming through – very easy. But almost every recipe I have looked at (and believe me, there have been many) suggested that dried or fresh beans be used to give an improved and authentic taste. The choice is yours. Ribolitta, The Recipe to remind you why you love cooking, eating and sharing food. Ciabatta Loaf - preferably stale, cut into big rough chunks. If using dried or fresh Cannellini Beans, soak beans in a generous amount of water overnight with the Bicarbonate of Soda. Drain the beans well. Place Beans in a pan, cover with fresh cold water and bring to boil. Simmer for 10 minutes, drain again. Place Beans back in washed pan, add enough fresh water to cover Beans by 5cm (2 inches), add roughly chopped tomato, garlic bulb and sage. Return to boil, turn down to simmer, covered. Occasionally remove any scum that comes to surface, and simmer until tender, which can vary from 40 minutes to 1 1/2 hours. Keep Beans in the water that they were cooked in. Then follow the instructions for the Ribolitta Recipe. In a very large pan heat 2 tbsp olive oil gently then add and lightly fry the parsley leaves, garlic, celery, carrot, onion, ground fennel seeds and pancetta (known as 'Soffrito' in Italy - a basic mix for many recipes) for approximately 20 mins - the mix needs to sweat gently. 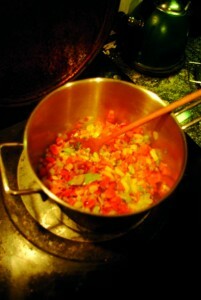 Stir in tomatoes, vinegar and water or stock to the mixture and simmer gently for another 30 minutes. Add the chopped Cavolo Nero and add either HALF of the dried or fresh Beans with enough of their cooking liquid to cover the Cavolo Nero) or HALF of the drained tinned Beans (adding more water or stock to cover the Cavolo Nero). Add the rough chunks of bread, gently stir round then allow to simmer for another 30 minutes. * Preparation Time: For the dried or fresh Cannelini Beans, Soak overnight, 10 mins Simmer and up to 1 1/2 hours bringing to the boil and simmering. Cabbage – Healthy Recipe Revelation! Recipe: Ribolitta Recipe – at last!